What did winning a prize at NEAP mean to you? Winning the photo-media section of NEAP means further recognition and a chance to more broadly share my work in the local area. The prize money is also of great help as I am investing it in framing and printing for some of my future projects. What is the winning work about? I think of my entry as a snapshot of life in Newcastle as it is today. To me the image represents the tensions and competing interests between Newcastle's traditional industries and it's more recent urban renewal. The image is taken from Honeysuckle which today is an area of recreation and leisure but was previously a part of the working port. It looks towards the grain silos and working docks of Carrington. I see the ship which is moving through the scene as a kind of representation of modern progress i.e. moving forward. Of course it's also a bloody big ship. Visually it's saying hey we are here (we being industry) and we aren't going anywhere. The tugboats always fascinate me as well, that tether between ship and tug, plus the disturbed water between ship and tug shows such a fascinating visual tension. What medium, processes and techniques did you use? This image is shot on a 35mm film camera. Photographing the harbour and city is an ongoing process for me; I shoot it from all sides, even from a kayak at times. 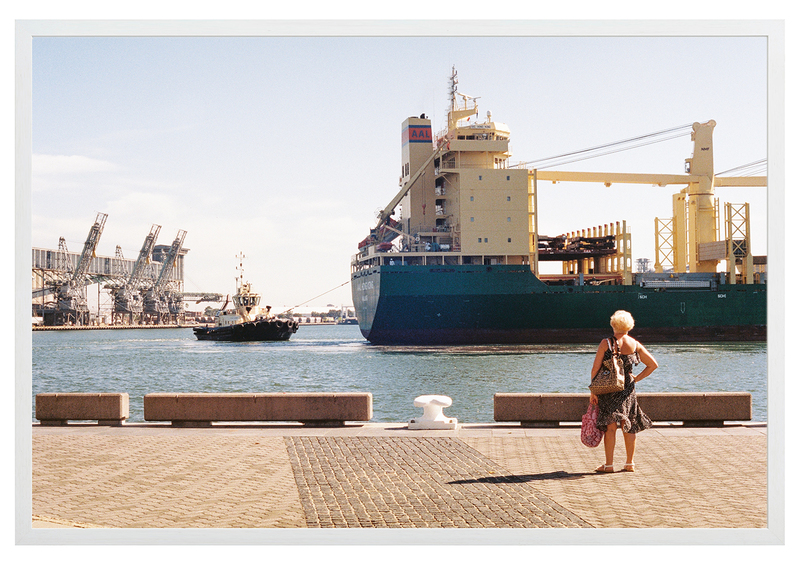 I've photographed countless ships from many viewpoints. The day I took this image I was commuting to work along the foreshore and as I noticed the ship I quickly found a viewpoint and arranged the image. It was one of those rare but amazing times when an image falls into place as the lady in the foreground began to walk into the area where I was. What is ahead in the next twelve months? I have a lot of things happening actually. I've very recently started selling more of my works online so preparing that has taken a bit of my time recently. Shortly I will be launching a new book project following up from my previous 2hrsnorth project which photographed all the suburbs of Newcastle. I'm also working on a project documenting suburban architecture and finally I'm preparing work for an exhibition at Photoaccess in Canberra which involves lots of work building and photographing models. That work is a dialogue about photography and the processes behind image-making which are not always evident. So I'm obviously super busy and really looking forward to those different projects hitting the public space in the coming months. 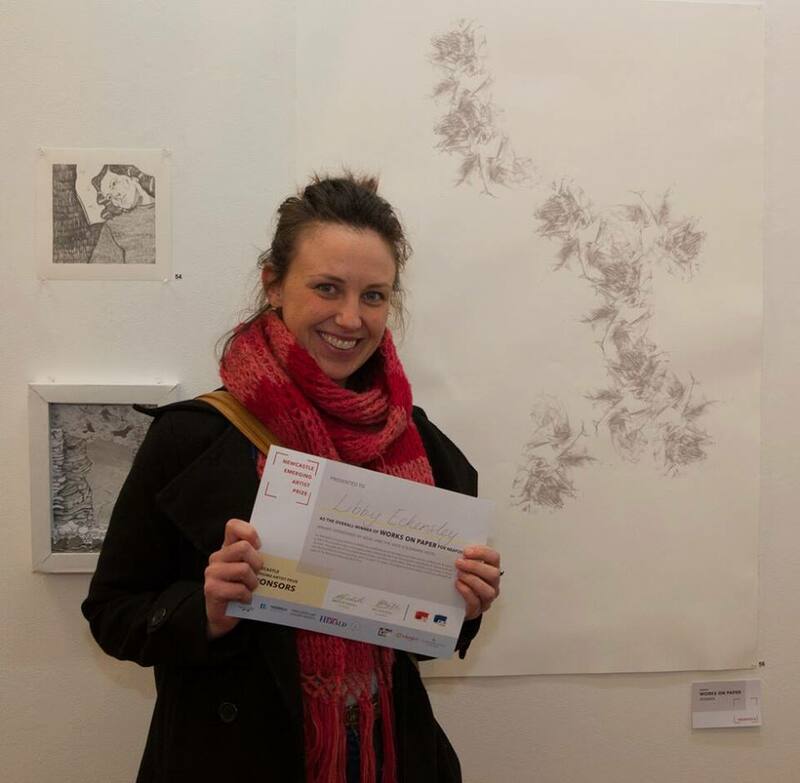 Winning the prize for 'Works on Paper' was a huge encouragement. Making art is a process so often filled with doubt. Doubt, not just in terms of what you are doing, but about the amount of time you spend doing it. The support awards like NEAP provides, boosts morale and provides important feedback about the reception of your work. I use drawing and print media to order thought and drive the creative process. The work, in a sense, is about the quality of thought material thinking provides. The work is a screen print of a drawing, of a photo, taken of a prior artwork called Information Mutations, 2015. For that piece, I cut and plaited strips of newspaper into long strands. The practice is process driven, and takes advantage of the ruptures that occur from one medium to the next. The next twelve months will see me immersed in my PhD candidature. I will undertake further making, reading and writing on processes of this kind.